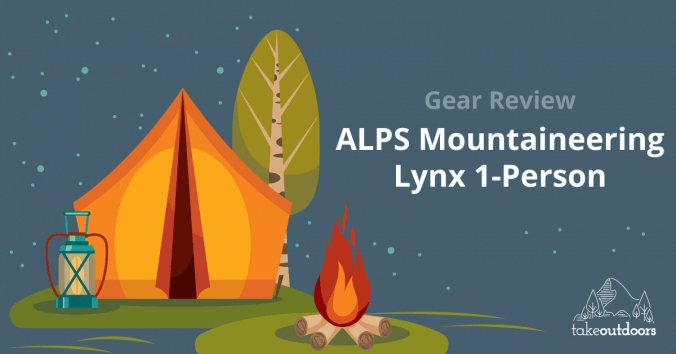 This ALPS Mountaineering Lynx 1-Person Tent Review will walk you through everything you need to know about this tent and will help shed light on why it’s one of the best choices out there. 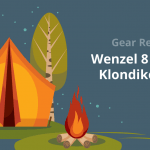 Your tent is perhaps the most important piece of gear you will bring with on your backpacking or camping trips, so it’s important to make an informed decision before settling on the right one. Few other pieces of gear will have as much effect on your comfortability while out in the elements, so it’s a critical decision to say the least. Luckily there are plenty of great tents on the market, and not all of them will break the bank. The ALPS Mountaineering Lynx is among the best values around when it comes to lightweight, single person tents. Overall, due to a plethora of top notch features packed into a very affordable price, I would recommend giving this tent a try. One of the Lynx’s best features is the fact that it will keep you dry through the night. The Lynx is a three season tent and comes equipped with a water right rainfly. Nothing takes the fun out of camping like a night exposed to rain moisture, and the Lynx excels in keeping the water on the other side of your tent. This tent not only keeps rain from entering, it also utilizes partially mesh walls that allow condensation to escape, which really comes in handy during the warm season. Additionally, there are two vents on the tent which can be opened and closed to provide additional airflow. Another great feature of this tent is that it is engineered with a large vestibule for storing your extra camping gear. The vestibule will accommodate your pack as long as it’s 65 liters or under. This is a single person tent, so the room is sparse in the sleeping compartment, making this is extra storage space an essential. The average camper should have enough room to in the vestibule to store all of their backpacking gear. There are also three mesh compartments within the tent which provide added storage. The Lynx is easily erected thanks to a free standing design. Most campers will have no trouble getting this tent up and ready for use in a matter of minutes, with disassembly being just as easy. Despite the easy set-up, this tent features a sturdy design that holds up to strong winds and inclement weather. With all these great features, an experienced camper would expect the Lynx to cost a hefty sum, but this tent can generally be found at a much more affordable price range. This is an enticing value, and luckily ALPS doesn’t make up for it by pulling the plug on quality. As far as single person tents go, you’d be hard-pressed to find a better bargain on the market. At 3 pounds 15 ounces, the Lynx is still a lightweight tent, though it’s on the upper end of that spectrum. It’s still not majorly heavy, though experienced backpackers know that every ounce counts, and there are lighter options on the market. However, the Lynx will still be within the appropriate weight range for a good number of backpackers, and shouldn’t be much of an issue for most, especially considering the low price tag. If you’re making a major trek like the Pacific Crest Trail, you may want to spring for a lighter product (with increased cost), but for the weekend camper, it won’t be too heavy to handle. Set up is always a consideration when it comes to a tent, and this is another area where the Lynx excels. The design is not only simple but intuitive, and campers who know their way around a tent will likely be able to get it set up without the instructions even. The two aluminum poles are inserted into their slots, suspending the tent with an x formation. The poles are then inserted into the ground to anchor the tent. It’s as basic as tent set ups come, and disassembly is just as easy as reversing the process. The Lynx is a single person tent, so we can’t have too high of expectations in the space department. That being said, the tent should be a comfortable fit for most people, though individual height and weight will factor in as well. The added vestibule for storage is essential, as there simply won’t be much extra room in the sleeping compartment by the time you climb in, though it’s not so small as to make you feel claustrophobic. All in all, the Lynx is serviceable in terms of roominess. The Lynx is very durable as 3 season tents go. While it features partial mesh walls in its construction to aid in ventilation, this tent exceeds at keeping harsh weather at bay and keeping you warm and cozy within. The materials utilized throughout the tent’s build are of high quality, and the workmanship that’s been put into it will be apparent. Despite the low cost, you can likely expect the Lynx to serve you well on your camping trips for years to come. The Lynx is a three season tent and will hold up in inclement weather conditions. While it wouldn’t be a great choice for winter campers who will be in snowy conditions, this tent will keep out heavy rains and winds in fall. While the intelligent ventilation systems in the design will allow condensation to escape in the warmer seasons so you aren’t sleeping in a humid environment. As long as you’re within spring, summer or fall, this tent shouldn’t give you any issues. As mentioned above, this tent utilizes mesh in the walls to improve ventilation, which will matter most to hikers who are traveling in areas with high precipitation like the Pacific Northwest. Condensation from your breath can create a damp environment within your tent if the ventilation isn’t right, which makes for less comfortable sleeping conditions and counteracts the effectiveness of your rain fly. Luckily, the Lynx has proven to be well ventilated, thanks not only to the mesh walls but also to two vents which can be opened or closed to preference. The Lynx packs a ton of value without straining your wallet much. This product generally costs a fraction of what other tents with similar specs would run you for. Despite the low cost, this tent manages to compete with other products with much higher price points, and you’ll definitely feel like your money is well spent. Price is also one of the biggest considerations, and luckily the Lynx accommodates pretty much any budget. 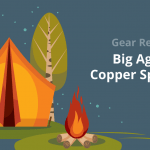 The Big Agnes Copper Spur Backpacking Tent is another top notch single person tent on the market, and you’ll find that the Lynx stacks up quite nicely against it. This product is quite a bit more expensive than the Lynx, which affords a lighter weight of a little over 2 pounds. Like the Lynx, the Copper Spur is a freestanding tent with a decent amount of interior space for its category. Set up with this tent is relatively straight forward as well, while the materials used should hold up for a number of years. The Lynx holds its own against the Copper Spur in pretty much every category, and it just goes to show that you don’t have to shell out hundreds of dollars for a quality backpacking tent. While Big Agnes’ offering cuts out about a pound of weight, which is a considerable amount, the Lynx makes up for it with the drastically reduced price tag. It boils down to how the tent will ultimately be used, but for most campers, the Lynx will likely be a better value. The MSR Hubba NX is the most expensive comparison we’re making for this review. A lot of the the NX’s specs read quite similar to the Lynx, with both being three season single person tents featuring a storage vestibule, waterproof design, and good ventilation. The Lynx has nearly all the same features as MSR’s product but at a greatly reduced cost. This will certainly be enough to win over a good deal of campers, but let’s take a look at the factors that make the Hubba NX such a high-end tent. A good deal of the higher price point is accounted for in the weight department, with the Hubba NX clocking in at just over 2 pounds, compared to the Lynx’s 3 pound and 15 ounces. That’s a good deal of weight reduction, coupled with high-quality material and construction and numerous other features. For serious backpackers, the increased price might be worth it, but comparing the two tents goes a long way towards illustrating just how great of a product ALPS has designed. NEMO’s Hornet is another solid single person tent, though you’ll find again that the Lynx compares quite favorably to it despite a large disparity in cost. It’s quite a bit more expensive than ALPS’ offering, though this is to expected considering that it weighs a little over a pound. While the Lynx can’t compete in the weight department, it holds up in a number of other areas that do their share to close the gap. Like the Lynx, the Hornet offers a vestibule for storage, a reasonably spacious interior, a simple, free-standing design and plenty of protection from the elements with a waterproof design. While the Hornet features an ultra lightweight design and a large door that makes entry simple, there is still plenty of overlap between its features compared to the Lynx. Like the other tents we’ve looked at, the Lynx simply seems to offer more quality for its price than should be possible. If weight is your primary concern, you may need to shell out the extra few hundred dollars. You will be trading cost for weight. The Lynx is the clear winner if you’re looking at the features to price ratio overall. I hope this review of ALPS Mountaineering Lynx 1-Person Tent gives you a clearer picture. 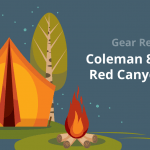 You can a valuable backpacking tent that doesn’t scrimp on quality to suit the budget. With the Lynx, ALPS has packed the most value possible into the price. It offers a tent that will keep you and your gear dry and cozy through three seasons of weather. The construction features durable, well ventilated material that will hold up against tough weather. It also keeps the inside of your tent condensation free. There will be certain campers who look at the pricier tents to get ultralight ones. The Lynx is a knockout bargain that balances budget and quality to an unexpected degree. You will be hard pressed to find a better value in the price range that ALPS offers the Lynx in. It is without a doubt one of the best single person tents out there.